Working with a beloved recipe duly attributed to a Berkeley chef, Paul Johnston, the vibrant orange of Germany’s freshly foraged chanterelles meld into buttery yellows and golden mustards after a quick flash in the pan. 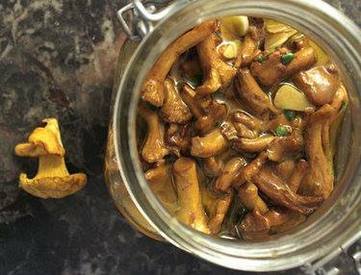 Like Höller’s intrigue in the elusive Soma recipe, the chanterelle, though popular, is a mushroom that retains its allure by its very selectivity. Although attempted manifold, the chanterelle is yet to be cultivated. It remains a feature of the wilderness, linking the craze for these meaty bites with the perfect conditions of rain and warmth. When the mushrooms emerge, they are harvested by nimble fingers found by keen eyes seeking out their telling orangey flesh amongst the browns of fallen leaves. But, be warned, like the precisely painted rows of polyurethane mushrooms in Höller’s work, the slight imperfections and characteristic color of a tasty chanterelle can be startlingly well matched by clever (and often poisonous) look-a-likes!